A long sabbatical and a rejig in weight categories notwithstanding, Olympic heroes Sushil Kumar and Yogeshwar Dutt reaffirmed their dominance on the world stage and ended a 28-year gold drought at the Asian Games in a successful 2014. Despite taking to the mat for the first time since the 2012 London Olympics and climbing up weight divisions after international governing body FILA revised the weight classes for its competitions (including those of the 2016 Rio Olympic Games), both Sushil and Yogeshwar proved their worth in the limited tournaments they participated this year. Yogeshwar, in fact, ended India's 28-year wait for gold in wrestling at the Asian Games by bagging the yellow metal in Incheon, South Korea, in September. Their eyes now firmly trained on the Rio Olympics, the star grapplers carefully picked their tournaments, contesting in not more than three competitions in 2014. But in those limited opportunities, the freestyle wrestlers came out with flying colours. After opting out of the Dave Schultz Memorial International tournament at Colorado Springs, USA, in February, followed by Freestyle Wrestling World Cup in March, the duo participated in the Senior International competition in Sassari city, Italy, on May 30-31. Putting to rest all apprehensions about how they would fare in their respective new weight categories and after a long break, the celebrated Indian wrestling duo sparkled on debut. Having shifted from 60kg category, London Olympics bronze-medallist Yogeshwar won the gold in the 65kg division, while two-time Olympic medal winner Sushil bagged the silver in 74kg class. Sushil, who had won a bronze in the 2008 Beijing Olympics before bettering his performance with a silver medal at the London Games four years later, had always contested in 66kg freestyle category. But the 31-year-old grappler, who had to add 9 kgs to adjust in his new weight bracket, made the jump look like a cake-walk. After claiming a silver at the Senior International tournament, Sushil asserted his class in the Commonwealth Games at Glasgow, Scotland, winning all his four bouts en route to a gold medal, rather comfortably. In the gold-medal bout against Qamar Abbas of Pakistan, even before one could blink, the contest was over with Sushil pinning down his opponent in under two minutes to stamp his authority. Yogeshwar also expectedly pocketed the gold with little trouble, using his trademark 'fitele' (leg-twisting) technique to great effect in all the four bouts he fought during the Commonwealth Games. After a successful and exhausting campaign in Scotland, both Sushil and Yogeshwar decided to skip the World Championships at Tashkent in September, in order to be fit for the Asian Games, which was slated to be held later that month. Sushil, although, ultimately chose not to go to Asiad, citing that he wanted to focus solely on 2016 Olympic Games, Yogeshwar boarded the flight to Incheon and brought back a gold medal once again. With a 100 per cent record behind him in 2014, Yogeshwar is aiming to win a yellow metal at next year's World Championships and with that an automatic berth in the Rio Olympics. Meanwhile, young Indian wrestlers Amit Kumar, Bajrang, Rajiv Tomar and women grapplers -- Babita Kumari and Vinesh Phogat -- made sure that the tri-colour continued to fly high. Spearheaded by the two Olympic medallists, the youngsters lived up to the expectations at the CWG, scooping 13 medals out of possible 14, including five gold. The Indian men's freestyle wrestling team started its 2014 season on a resounding note by producing a best ever performance at the Dave Schultz Memorial International tournament, winning four medals, including a gold by Praveen Rana. 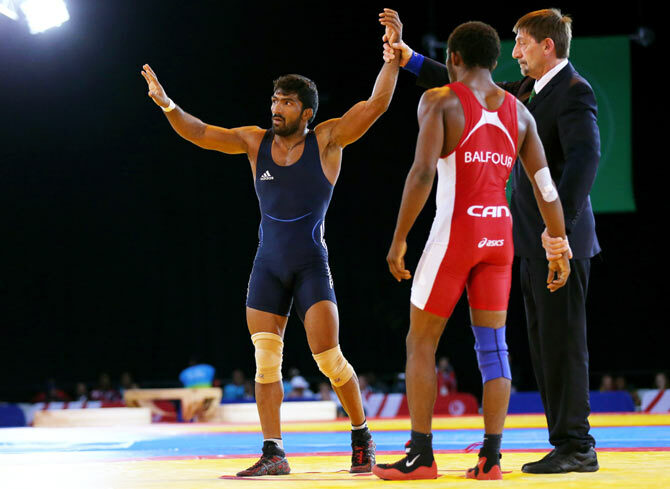 Rana won his gold medal in 74kg category, while Amit Kumar settled for a silver in 57kg. Sandeep Tomar and Bajrang also put on impressive performances, winning bronze medals in 57kg and 61kg, respectively. Thereafter, World Championships silver-medallist Amit Kumar won four of his five bouts as India finished sixth in the FILA Men's Freestyle Wrestling World Cup. At the Junior Asian Wrestling Championship, India won a gold, three silver and one bronze at Ulaanbaatar, Mongolia. Vinesh (51Kg) won the gold in Greco Roman style, while male grapplers Ravinder (60Kg), Sandeep (84 Kg) and Anil (50 Kg) clinched silvers in Greco Roman Style. Motivated by her cousins Geeta and Babita, 19-year-old Vinesh became the youngest to win a medal on her debut in CWG by pocketing a gold in women's freestyle 48kg category. Even Babita ended at the top of the podium in women's 55kg freestyle. Indian wrestlers had their share of disappointments too. While they could win just five medals at the Asian Games, they returned empty-handed from FILA World Wrestling Championships. In the wake of the top wrestlers opting for Asian Games over World Championships, the second-string side failed to win a medal for the country. Even last year's Greco Roman hero, Sandeep Tulsi Yadav, who created history by winning India's first-ever medal in this category, came a cropper, going down in the Round of 32 in the 66kg division. In general, Indians fell flat in the Greco-Roman competition, which has never been their forte, failing to achieve anything of significance. But overall, there was more to cherish in terms of achievements. And the fact that the two most prominent faces of Indian wrestling continued to excel and are determined in the run-up to the Rio Olympics, is definitely good news for the country.